The best lesson I learned to balance my blood sugar when snacking? Pair carbohydrates with a quality fat for maximum energy. Having snacks to carry around on a full day out of the house makes a world of difference. If you always have something nourishing on hand there's no question about what to eat and when you can eat. Functional food for the win. Sweet potatoes are a prebiotic food. Prebiotics are not the same thing as probiotics. A food that has prebiotic properties means that its fiber content benefits the good bacteria already living in the gut. Sweet potatoes come in a plethora of colors, and you can substitute any color here. Collagen peptides provide the amino acids that act as building blocks for connective tissue in the body, you can read why I started taking them on this post. So while that's not the only way I'm getting these amino acids since incorporating some animal products back into my diet, everything from joints to your hair can benefit with some supplementation. Pit the dates and soak in warm filtered water for 5 minutes to soften. Weigh out cooled sweet potato on a scale. If you don't have a scale, mash the steamed sweet potato first and measure about 1/2 cup to use. Drain the dates and squeeze excess liquid from them, then add to a blender with steamed sweet potato. Blend until smooth. Scrape out ingredients from the blender and add to a medium bowl. Stir almond butter, melted coconut butter, collagen peptides, vanilla extract, and salt into the mixture of dates and sweet potato. Refrigerate for 30 minutes once well incorporated. If using desiccated coconut, toast on stove in a castiron pan until golden brown and fragrant. Place toasted coconut on a plate. Use a medium cookie scoop (1.5 tablespoons) and roll dough into balls. 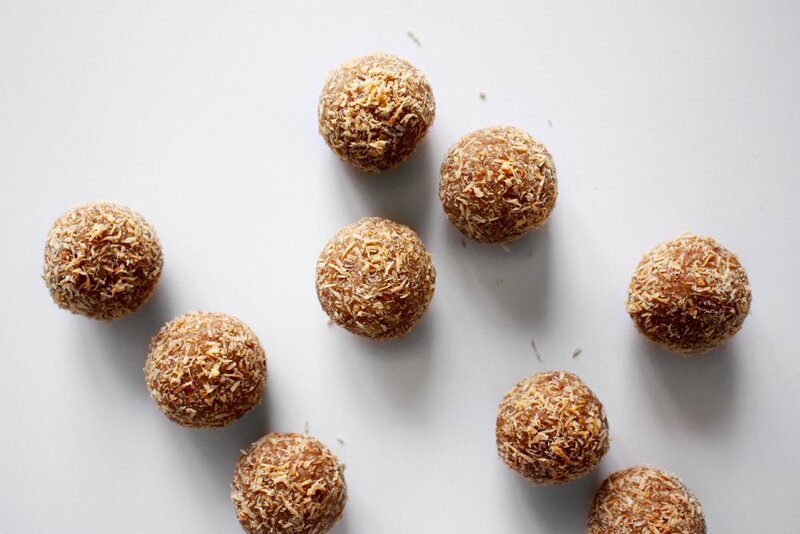 Roll in toasted coconut if using, refrigerate balls to store.